When a death happens, everyone will be in grief and it’s difficult to coordinate things around. We help by breaking our services into 2 phases. Readings and sermon: a psalm from the Bible is read out. It is often Psalm 23, ‘The Lord is my Shepherd’. Verses from the Old or New Testament are also read. Personal readings: The priest will talk about the person who has died. This can be quite a personal section, reflecting on the person’s life and their role in the Christian church. A family member or friend may wish to read out a poem or a passage from the Bible. Reflection: Silent time for reflection. The congregation is given a minute to reflect on the deceased. Commendation and farewell: The priest speaks these words: “Let us commend (the person’s name) to the mercy of God, our maker and redeemer.” The priest then reads a prayer of entrusting and commending. The committal: this is probably the most solemn moment of the service. At a burial, this is when the coffin is lowered into the grave. 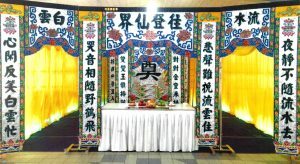 At a cremation, the curtains are closed around the coffin. “We therefore commit (his or her) body to the ground; earth to earth, ashes to ashes, dust to dust; in the sure and certain hope of the Resurrection to eternal life.”There may also be a selection of hymns which are sung throughout the service.Some parishes still have space for burials. The burial follows a church service and the family and friends of the deceased gather round the grave for the Committal. It is tradition to throw some dust/mud onto the coffin. A short prayer will be said by the minister.For those who wish to be cremated, the body is taken to a crematorium, where it is burned. At the point of Committal, the curtains close around the coffin. The ashes are put into an urn and given to the family, who may choose to keep them or scatter them in a place that was meaningful to the deceased.